We had a mean rooster once. Well, maybe mean isn’t the right word… He was just very protective of his hens. You had to wear long boots and watch your back whenever you went into the chicken run. One day he attacked one to many people. 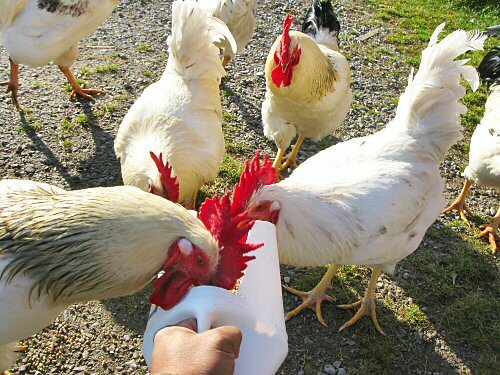 We had rooster soup for dinner that night. I have had chickens for over 30 years. If you handle them daily from the time they hatch the can become quite friendly. Roosters often get nasty. Generally it is best to do as you did and put them in a soup. Never trust even the friendliest rooster around children. Mean roosters are great to have around because then you don’t feel guilty putting them on the kitchen table. See, there’s a bright side to everything. I actually found your site a few months ago when I was searching for others that had tried raising Frey’s dual purpose chickens. I had 14 of them this summer. I processed them as we wanted to eat them. The last one was about 16 weeks old and the leg meat was beginning to get tough. One rooster looked after the hens well and was more social then all the other roosters. We still have him to keep the layers company and is doing a great job. I look forward to raising a larger batch of the dual purpose next spring. We’ve been eating old roosters a lot this summer. We have a bunch of Rhode Island Reds and other layer breeds that we hatched ourselves. Cooking them so that they are palatable has been a bit of a learning experience. This is so far what has turned out to be the best combination: some form of marinating / brining, then very slow cooking or pressure cooking. We tried just slow cooking, but the meat was still quite chewy. Most of the roosters we’ve been pressure cooking with salt, carrots, celeriac and onions. The resulting stock is great and then we freeze containers of shredded chicken that later gets used for chicken salad or tossed with pesto. The meat goes very far this way and is super convenient to use. I have been thinking more about the economics of raising these chickens though. The laying hens are definitely worth it, but the roosters that are slaughtered at 15+ weeks eat WAY too much feed to make them worth what you get out of them. I am really starting to think that raising some of what they eat would make the equation work out better. I think their diet can be messed with a lot more than the meat hybrids and so it might be possible to raise more food for them. I believe for a dual purpose breed you should try Plymouth White Rocks, not Rhode Island Reds. There is more meat and they lay nearly as well. If a rooster has begun crowing, it is soup, not to be roasted. Something about the testosterone in the meat or something makes them chewy. Put em in the freezer before they crow. Probably at least at 5 months. I have raised the meat birds from years ago and they had more feathers and weren’t quite like the modern almost featherless one’s I have seen. I still say find someone that has a cornish rooster and some white plymouth rock hens, then get some of the chicks just to see. I enjoy talking about chickens. If I post too much or bother the admin on this blog, please just delete my comments, I won’t be offended. I don’t think on the home scale chicken farming you make money. You might break even if you don’t consider equipment and labor. I keep my flock for the pleasure of just watching them. It is inexpensive enough so that eggs or meat are just a plus.